The Best Summer Day Sipper! I’ve had a hundred summer whites so it’s time to name a favourite. Mine and friends. 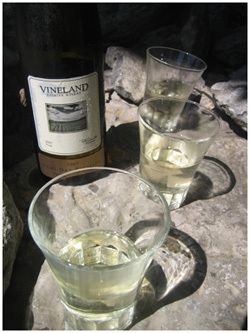 The white wine that has made most people happy is a semi-dry Niagara Riesling from Vineland. It pulls off the trick of being both yummy, fruity and refreshing. There is a vitality and a charm that echoes the joyful feeling of summers days. Guaranteed to make you glad you took the day off! How great is that! This winery has never compromised the tart nature of Riesling so when their label says semi-dry, they really mean ‘normal’ dryness. Weighing in at only nine percent alcohol this is one of the gems in local wine for the summer season. However, a screw cap would be handy. A brighter package is already in the works.